40 votes (38.83%) indicated that this practice should be approved by patients. 32 votes (31.07%) expressed their approval of this practice as long as it is for educational purposes. 19 votes (18.45%) expressed their total rejection to this practice and believe no reasons should justify it. 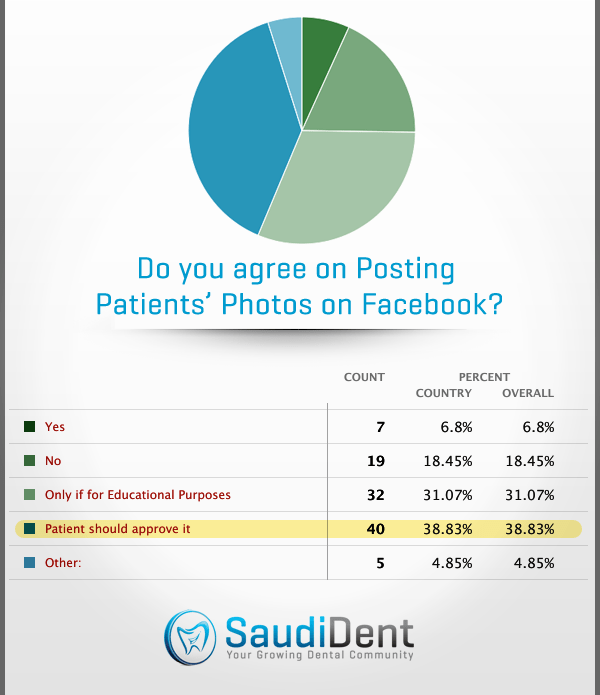 7 votes (6.8%) believe it is ok to publish patients’ photos on Facebook!. 5 votes (4.85%) expressed some thoughts such as (Only teeth should be shown and no face, only intra-oral images can be published and some believes of knowledge sharing). I believe that this issue is very sensitive and many dentists still publish their patients’ photos to online social network such as Facebook without having a permission to do so. I guess it is time to have a policy and regulation regarding this practice which will ensure that the privacy of our patients is maintained.